Ask fellow campers about "Sherman Oaks Campground" and nearby attractions. We have a 43' MH and the spot was fine. Gravel, close to level, 50 amp, full hook-ups with sewer, and quiet. Some of the rigs in the park were old and run down, but who cares? I don't have to stay in them! We were able to receive DirecTV satellite, too. We're not here to stay in the park during the day... Lots to see and do around this area. We're fine at PA rate. Might look elsewhere if had to pay full price. We camped at Sherman Oaks Campground in a Motorhome. Pulled into the middle of the RV park, as every site that had trees were taken by people living in the RV's/Trailers, etc.. Sites are so very close together, even though there was NO ONE there, except those living there. Be prepared to have no shade. There was a pool, but the park is run down, and we weren't even going to chance it. We camped at Sherman Oaks Campground in a Motorhome. 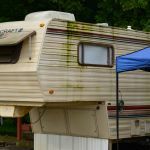 It's a little scary with all of the 'long timers' in their dirty run down RVs and sites littered with treasures (or some would say trash). But, everything works - water, electricity, sewer, and wifi (sort-of). A step, maybe, above Wal-mart. Or, not. Very few transients and no Class A Coaches (other than us). We camped at Sherman Oaks Campground in a Motorhome. After reading the other reviews, almost didn't come but there were several attractions we wanted to see and this park was convenient to them and with Passport America the price was good. We didn't find a problem with staying here. Level sites, good elec, wifi could have been better but ok. As a place to stay while touring the area (we were gone most of the day) it works. We camped at Sherman Oaks Campground in a Motorhome. We agree with the last poster from October of 2014, the place hasn't changed. Still pretty old and run down. Had to go to the Manager's trailer to register and the wife came to the door in her PJs, and this was at 1 in the afternoon. We just hooked up the electric and water and didn't even try to check out their facilities. It works for the Passport America rate, but if paying full price, I'd find a Walmart, but it works for an overnight stop as long as you're fully self sufficient, otherwise pass on by. We camped at Sherman Oaks Campground in a Fifth Wheel. The price reflects Passport America rate. Campground is old with old trailers and some permanent residents. There was even a burned out trailer and many that had seen better days. The bathrooms are small and dirty. There is a laundry with two washers and dryers. The sites are gravel and pretty level. This place is OK if you need quick access off I-40 for a good night's sleep and you are fully contained. Otherwise, my advice would be to move on. The Wi-Fi worked well, but there is no cable TV. We camped at Sherman Oaks Campground in a Travel Trailer. Very old and run down. Web site says they take Passport America and other discount clubs, but when we asked they said not on a holiday weekend. The web side did not say they excluded holiday weekends. We only stayed one night. We walked by the shower and bathroom area and the doors were open. We did not go in as it looked very dirty and run down. 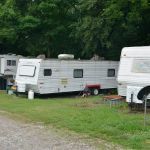 Many of the sites have permanent old RV's and trailers on them. 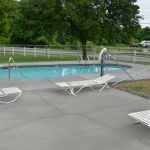 There is a pool and small playground area for kids and a laundry room but way over priced for what you get. We will not come back again. We camped at Sherman Oaks Campground in a Motorhome. Great park but I had to move between sites to get one with a working 30A box. And, when I hooked up, there was a loud noise from the inside circuit cabinet and smoke rolled out of the entrance box. After disconnecting and airing out the inside, I moved to a different site with no problem but the damage had been done. A Very large voltage spike ruined my AC/DC converter (capacitor exploded) in a 5 year old Intelli-Power. Camp manager gave me a substitute DC charger, was sympathetic and said to contact the owner. No response a week later. We camped at Sherman Oaks Campground in a Motorhome. Comments are the same as for the last entry. Only good for an overnight stay. If 40' MH the park is tight, but you can make it. Park is not worth the $18 PA rate. Would not stop again. We camped at Sherman Oaks Campground in a Motorhome. Rate is the Passport rate. About 4 miles off of I-81. Maybe 2 miles from I-40. Lots of noise from I-40. Strictly a level place to park for the night. Self service. You arrive and call the owner. He gives you instructions how much and where to pay. You open the gate and let yourself in. Close the gate behind you. Lots of permanent residents. Good electricity. We camped at Sherman Oaks Campground in a Motorhome. We had called the campsite several times to make sure they could accommodate us, it was difficult to get them on the phone which should have been the first clue. We arrived to a completely empty, closed for the season site and via phone told to pick any site and put our money in an envelope. The bathrooms were closed for the season and electricity at the site shut off, contrary to what we had been previously promised. Whoever was on the other end of the phone made it clear he had no intention of coming over to help us, he didn't care whether we stayed or left, so we left. I can appreciate that this late in the year and at a Passport America rate we shouldn't expect much, but this campground outright lied to us. So far we have traveled near 50 campgrounds in 6 months and we put this at the bottom because if management. We camped at Sherman Oaks Campground in a Motorhome. This is strictly an "overnight" campground. Everything is done over the phone and honesty method. A rolling fence is in place. You have to let yourself in an out. The water quality was so-so. It was close enough to the highway to feel secure. We were the only campers there for the night. Plan your exit if you are there in a longer unit. One site is best to pull through and around. We camped at Sherman Oaks Campground in a Truck Camper. 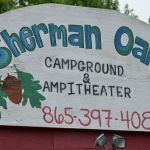 Are you affiliated with Sherman Oaks Campground ?